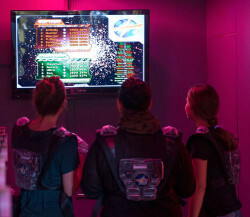 Arrange a Laserforce game for your class, team or club at any time at Hawke’s Bay’s most high-tech attraction. Pit classmates against classmates, form against form or even arrange an inter-school competition. Or for the ultimate challenge… staff vs. students! Laserforce is open every day of the year (except Christmas Day), so it’s a great all-year-round facility you can take advantage of right here in Hawke’s Bay. This also makes it especially useful as a last-minute substitute if a sports match or other outdoor pursuit has to be abandoned due to wet weather (subject to availability). We strongly recommend that you call us at least a couple of hours before you’d like to play. Laserforce is open during the day on weekdays only for pre-booked games, and we wouldn’t like you to be disappointed. A game lasts for ten minutes, but you need to allow at least 20 minutes which includes briefing and kitting up before the game – and checking scores when you’ve finished playing. If you have more than 20 players in your group, allow 20 minutes per game for each group of 20 players. EMAIL US if you’re planning a little further ahead.